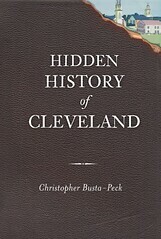 Cleveland Area History: A bit out of place? When I first saw this apartment building, at 8115 Wade Park Avenue, in Cleveland, Ohio, I thought it looked a bit out of place. The beautiful façade seemed out of place with the ordinary structure of the apartment block behind it. I knew that there had to be a story behind this. The block was built in 1901 for Genessee Savings and Bank Comany. The architects were Steffens, Searles and Hirsh. The Ohio Savings Bank building on West 25th Street in Ohio City is one of the firm's notable commissions. The bank occupied one half of the first floor. Another commercial enterprise rented the other half. The second and third floors contained apartments. The entire side of this block was built this way - apartments blocks, most with retail on the first level. The exception was the fire station immediately to the east of this building. The design of the block explains the construction of this structure - the sides wouldn't have been seen, because they would have been close to touching the adjacent buildings. Immediately west of this building was a bowling alley. At the east end of the block, there was a drug store. For an apartment building, the level of detail is impressive. It was clearly geared toward a more affluent renter. Note the level of detail in the windows, or here, in the railings on the balconies. To answer the question that surely has been on the eyes of many of the people who have driven past this structure, yes, this was originally an apartment building. I can only imagine how interesting the interior might be.